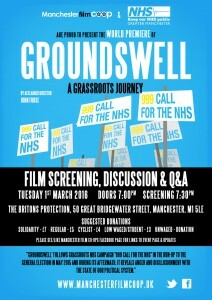 Manchester Flim Co-op and Keep Our NHS Public Greater Manchester are proud to present the world premiere of “Groundswell: A Grassroots Journey” by acclaimed director John Furse with Q+A. 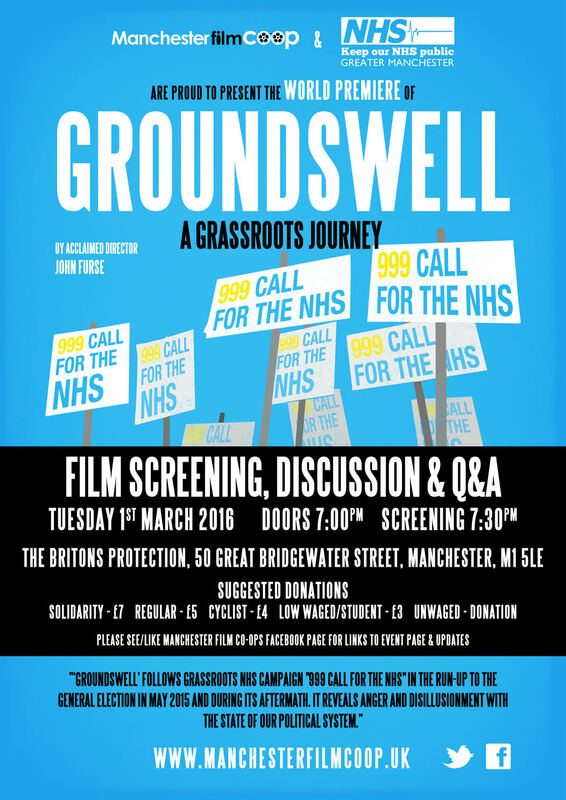 ‘Groundswell’ follows grassroots NHS campaign “999 Call For The NHS” in the run-up to the General Election in May 2015 and during its aftermath. It reveals anger and disillusionment with the state of our political system. Featuring Corbyn, Green MP Caroline Lucas and former Shadow Health Secretary Andy Burnham it’s a film that covers a tipping point in Britain’s political landscape “a fight not just for the NHS but for our Nation’s soul”. Starting with Darlington working mum Joanna Adams sending out a tweet from her living room. It ends with the campaign group she founded leading thousands into Trafalgar Square at the culmination of the group’s 300-mile Jarrow to London People’s March For The NHS in September 2014. Their March was a journey of struggle and hope. But it was also a journey that took them into the darker recesses of British democracy as they were confronted by the machinations of the party politics they defied. Independently made by a team including some of the leading documentarists of the last 40 years, it is both a personal and moving journey and a searing indictment of our media driven corporate political system. The screening will be followed by a question and answer session with the director John Furse also a special guest from 999 Call for the NHS. Date: Tuesday the 1st of March.